Below is a list of (single sheet, loose) maps of the complete county published post-1837 which I am offering. Information concerning the maps and details of size, state etc can be found by using the link provided which will take you to the relevant page of The Victorian Maps of Devon. This link opens the text information, for images scroll to bottom of page and click Images. I have many atlases - email me if interested. All prices in Euro. Contact me for details of discounts for multiple purchases. 1. c. 1842. Pale outline colouring. 119.2. 2. c. 1842. Uncoloured. 119.2. Two copies. 3. c. 1850. Hand outline colour to divisions. 119.4. 4. c. 1850. Hand outline colour to divisions. 119.5. 5. c. 1858. Printed colour. 119.6. Wide margins. Two copies. 6. c. 1860 Printed colour. 119.8. Wide margins. DEVONSHIRE with CORNWALL & SOM. Three copies of the maps engraved by Hughes as used in National Gazetteer etc. published by Virtue and used in editions 1864-86. See B&B Victorian Maps 144. 2. Printed colour. 144.2. London: Virtue & Co.
3. Printed colour. 144.3. London: Virtue & Co. Heights in feet added. 1. c. 1874. Printed colour. 149.3. 2. c. 1876-77. Printed colour. 149.4. 3. c.1880-82. Printed colour. 149.7. Three Maps See B&B Victorian Maps 153. 1. Bartholomew's map as used in Encyclopaedia Britannica and used in editions c.1877. Printed colour. W & A K Johnston imprint. 153.3. 2. Bartholomew's map as used in Black's Handy Atlas and used in editions c.1892. Printed outline colour to divisions. 153.2. 3. Bartholomew's map as used in Encyclopaedia Britannica and used in editions c.1877. Printed colour. 153.1. Map of the Diocese of Exeter – i.e. map of Devon and Cornwall by W J Sackett, Birmingham, for A New Set of Diocesan Maps by James Thomas Law and William Francis. Size 365 x 500 mm. Also two pages of text with all archdeaconries etc and index map (also Devon and Cornwall). See B&B Victorian Maps 143 and page xxxi of Victorian Maps. The Encyclopaedia Britannica. Vol VIII only of an American version of the Ninth Edition published by The Werner Company of Chicago with maps incl. Devon, Durham, Dorset, and Derby (as well as Denmark, Egypt and Delaware). Only two copies known in GB. Map is litho enlargement of B&B Victorian Maps 153.1, ie new and unrecorded state 1A. 612 pp, recently rebacked and strengthened with new EPs. Paper brown throughout. Size: 490 x 515. Insets of Exeter and Plymouth. Post-1900 copy of B&B Victorian Maps 159. Central vertical fold has creases and a tear where pasted into directory. Few slight tears to top edges. Printed colour. Comparatively rare - useful if Directory is missing its map.. Size: 220 x 270. Early copy of B&B Victorian Maps 132.2. Comparatively rare. One of W H Smith & Son’s Reduced Ordnance Map series. The section is taken from Bartholomew’s Imperial Map map. SeeBatten and Bennett, Victorian Maps of Devon (second edition, 2010), B&B 150.6. Tentatively dated to 1884 with railway to Hemyock added Map title is North Devon: size is 340 x 460 mm. Folding into stiff (faded) red cloth covers with plain paper label. Still has Scale of Miles, E. Teignmouth and WEST TEIGNMOUTH and signature is J Bartholomew, Edin. Map clean, cover grubby. 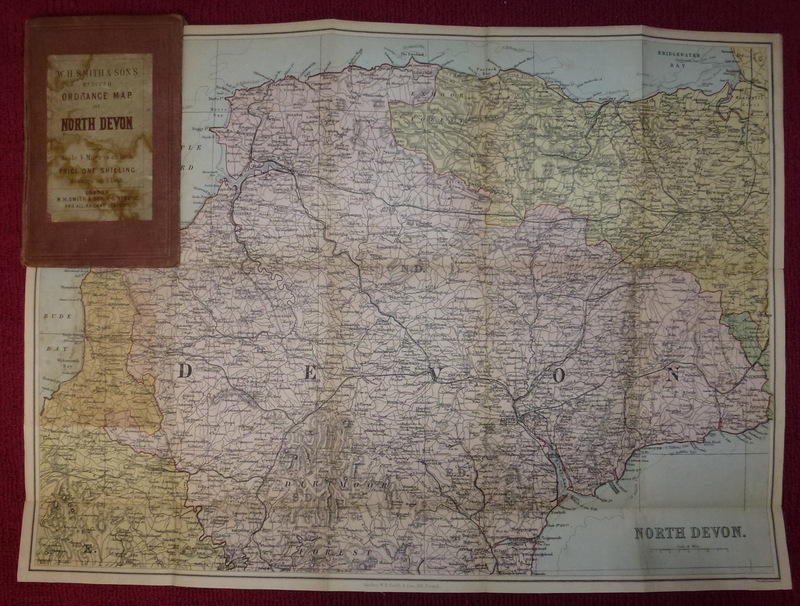 See website Victorian Maps of Devon entry 150 state 6 (1860) for details of the Devon map in this series at http://www.victorian-maps-of-devon.eu/150t.php. Sheets 15 and 16 of 19-sheet map of England and Wales. Both maps in card covers – Cornwall in poor condition but complete, Devon in very bad condition and lacking front cover. Folded size 200 x 120 mm. Both maps laid on linen (but not dissected). Cornwall opens out to c. 750 x 1000 mm. Crisp bright colours but one small brown stain in Atlantic and one large red (ink?) smudge in English Channel. Title across top: “GEOGRAPHIA” TWO MILES TO ONE INCH MAP OF ENGLAND & WALES (IN 19 SHEETS) BY ALEXANDER GROSS FRGS. Devon opens out to c. 1000 x 750 mm. Crisp bright colours but some small brown stains in Lyme bay area. Title top left: “GEOGRAPHIA” TWO MILES TO ONE INCH MAP OF ENGLAND & WALES (IN 19 SHEETS) BY ALEXANDER GROSS FRGS. Probably from 1950s or 60s. FREE - buy any map from this page and get these free!